" In the Middle Ages, the Abbey of Our Lady (Vor Frue) in Elsinore was inhabited by Carmelite monks; a religious order of mendicants who did not own property and relied exclusively on charity to survive. The abbey was created in 1430 by King Eric of Pomerania. The building burnt down in 1450 and was rebuilt in the decades that followed. 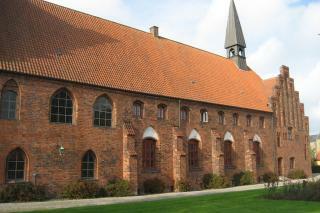 Unlike the two other Medieval abbeys in Elsinore, the Carmelite abbey has survived to the present day. When the abbey was closed in the Reformation in 1536, the abbey church was converted into a German church. From 1819, it served as an ordinary parish church. The entire abbey complex has survived, and is regarded as one of the best-preserved of its kind in Scandinavia. " All monasteries were served by people trained in caring for the sick. As a rule, such nursing was reserved for the monastery's own residents. But a few monasteries, such as the Carmelite abbey in Elsinore, also took in the sick from outside its walls. In 1516, the abbey was granted a royal licence to run a hospital for the many foreign sailors in Elsinore. The hospital was located in an annex, which now contains the town museum. After the Reformation, many urban monasteries were converted into hospitals", which were in fact poorhouses for the poor, sick and aged. The same happened in Elsinore at the "Our Lady" hospital. This hospital existed until 1916. The west wing contains Konesalen with 32 alcove beds for female inmates. "